This this the terrifying moment a 13-year-old girl almost gets run over as a careless driver drives quickly through a zebra crossing while the traffic light was still flashing amber. Even after the red car nearly hits the school girl it doesn’t slow down once as the driver continues down Shenley Lane in Birmingham, which passes by three schools. 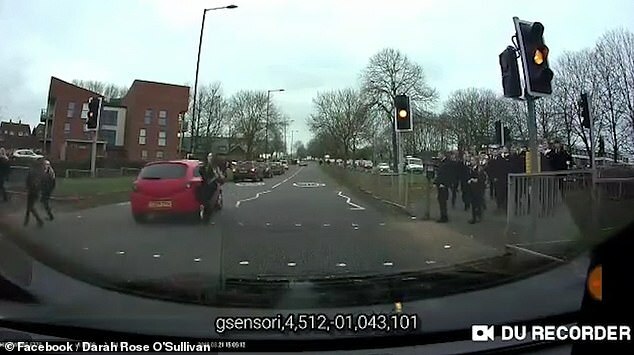 Dashcam footage shows a car slow down and stop at some traffic lights while a large group of school children cross the road. Once the traffic light starts flashing amber, the car with the dashcam stays still and shows three more school girls run across the road before the lights change. As the last girl gets halfway across, the red car speeds through the crossing and just misses her while skimming the coat she’s holding in her arm. The girl quickly jumps out of the way and avoids being hit by the car but it passes by with such speed that her hair and coat are blown away. Thanks to the dashcam footage, the family of the school girl were able to report the driver’s licence plate number to the West Midlands Police. Darah Rose O’Sullivan posted the dashcam footage to Facebook with the caption: ‘Absolutely shocking!! Happened today on Shenley Lane – Birmingham.